Our editors would like to be able to see all locked items at a glance to be able to clean up locks. There is of course the option to show locked items in the Quick Action Bar in the content tree, but it doesn't show if any descendents are locked, only items currently showing so this doesn't really help. Is there something out of the box or do we need to use Sitecore Powershell Extensions or something else? 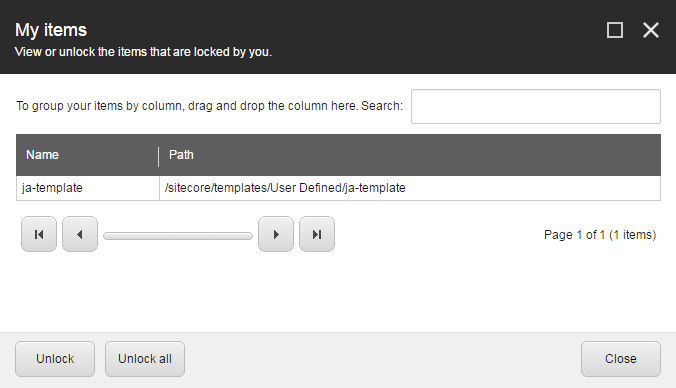 Sitecore Powershell Extensions is always the answer. There is a standard report available. More info here. Sitecore query : /sitecore//*[@__lock!='' and @__lock!='<r />'] This could take a while though..
Index query: (lock:true AND _latestversion:true) You could skip the latest version here if you want it for all versions.. Note that it is not recommended to run XPATH on Live site since it may cause performance issue if you have too many items. I've installed the Advanced System Reporter module in the past, and the content team really enjoyed some of the reports that could be created. Viewing locked items is one, but the tool is pretty granular so it can give a bunch of different insights. Instead of getting Content Editors to do this you could look at an solution to Auto-unlock items. This works really well for us and avoid content authors leaving items locked and having to manually unlock them. We didn't do this but It seems like a nice solution also for trusted content authors. Is it possible to extend the Content Editor search? How do you extend the item:new command without breaking a previous patch for it?